Mars is the fourth planet from the Sun in our solar system and is nicknamed the red planet because the iron oxide on the surface of the planet gives Mars a reddish colour. The name Mars comes from the Roman god of war. Mars is the final of four terrestrial planets in our solar system and it has similar features to those on the Moon and our Earth such as craters, volcanoes, valleys, deserts and polar ice caps. It is approximately half the size of Earth and is a particular favourite among science fiction writers – probably due to the dramatic colour of the planet. Even though Mars does share some geographical features with Earth it does not house the animal and plant life that Earth does. Currently it is thought that there is no life on Mars and the belief that flowing water was present on the planet due to the discoloured areas on the surface has proved to be false, although there is some evidence that there is ice. 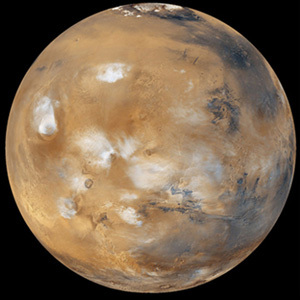 Find out more interesting facts about Mars by reading on. Mars is approximately half the size of the Earth. It measures 6,800 km across, has 1/10th of the mass of Earth and is located 228 million kilometres from the Sun. Mars has two moons, Phobos and Deimos. These are both small moons which have irregular shapes. It is thought that these may have originally been asteroids pulled into orbit by Mars. Mars can sometimes be seen in the night sky by the naked eye. Mars orbits the Sun every 686.98 Earth days and completes a full rotation every 24 hours, 37 minutes and 23 seconds. Studies have shown that there are seasonal dust storms on Mars that can be so large that they engulf the whole planet with winds that can reach 90km/h. Mars is home to the largest canyon in the whole of the solar system, the Valles Marineris, which runs 4,000 km long, 7 km deep and 200 km wide. The largest volcanic mountain in our solar system is also located on Mars. The Olympus Mons (this means Mount Olympus in Latin) is 25 km in height which is three times the height of the largest mountain on Earth, Mount Everest. Before the mid 1960’s it was believed that Mars maybe home to large continents and seas based on different light and dark sections that could be viewed on the planet by telescope. It wasn’t until the flyby in 1965 by the US spacecraft Mariner 4 that closer examination showed that the light and dark sections were optical illusions. Although no water was discovered on the surface of Mars, later the NASA’s Mars Odyssey spacecraft discovered that there was water underneath the surface of Mars in the form of ice. Mars currently has three orbiting spacecraft; Mars Odyssey, Mars Express, and the Mars Reconnaissance Orbiter and there are two spacecraft on the surface of Mars, the Mars Exploration Rovers (Spirit and Opportunity). Mars is a cold planet. Average temperatures at the equator are -5 degrees Celsius to -87 degrees Celsius at the poles. The north part of Mars is considerably warmer than the south part due to the eccentricity of Mars’ orbital path. The Martian atmosphere is mainly made of carbon dioxide (95%) with the rest being nitrogen and argon. The gravity you would experience on Mars is roughly one third of the gravity on the Earth. 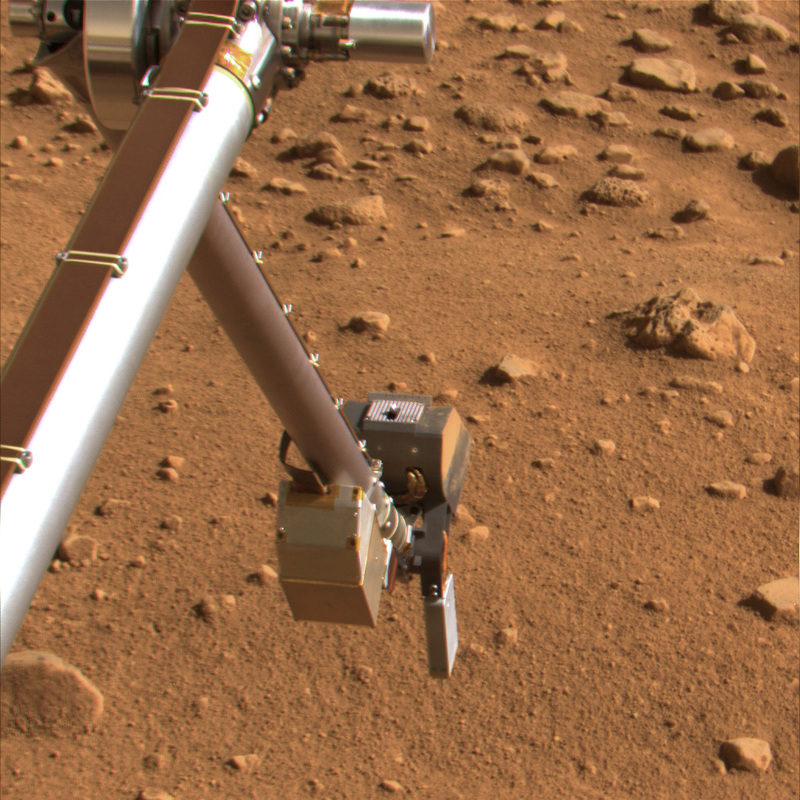 This means that if you were to leap into the air on Mars you would jump three times as high as you would on the Earth.